Not specified in story – I made it mid morning. Harsh, strong desert lighting. I have used warm colours on the colour wheel (yellow & oranges) as the dominant hues used in this scene. I have used cool blues & violets in the shadow areas to contrast with the warm colours of the harsh desert sunlight. Short shadows indicate that the sun is overhead. In the original version I made the inn keeper female, but I noticed that the Bible text refers to “him”, so I needed to make the inn keeper male instead. 01) (Previous page) Luke 10 – Parable of the good Samaritan SET01 – Scene 04 – Arrival at inn. The original drawing, which has rather grey/brown tones. 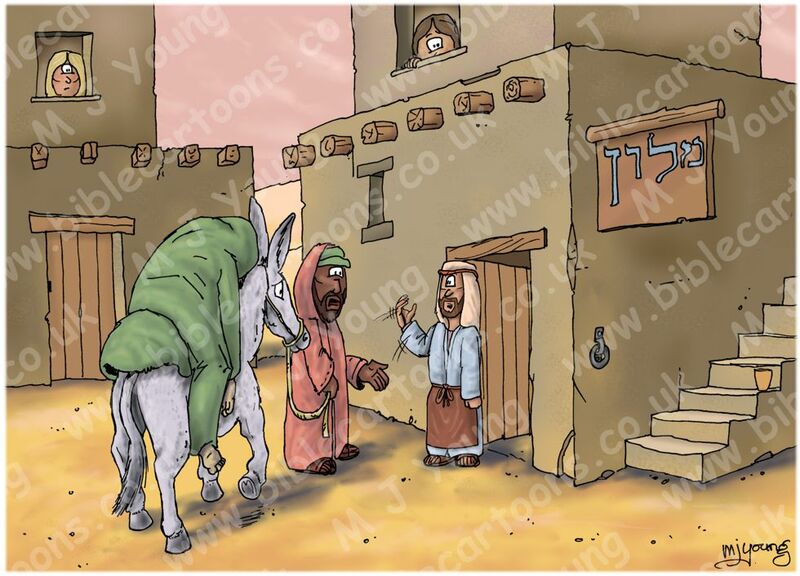 02) (This page) Luke 10 – Parable of the good Samaritan SET02 – Scene 04 – Arrival at inn. The “new” (2016) drawing, which has brighter reds, oranges & yellow tones. As you may notice from the titles above, there are two complete sets of the 5 scenes that comprise the story of the good Samaritan. The principle difference between them is colour: SET 01 is the original series of drawings, which have rather grey/brown tones, whilst SET 02 has brighter reds, oranges & yellows throughout the series of cartoons. The water in the background is the Dead Sea. Jericho is off to the left, Jerusalem off to the right. I researched the Hebrew word for “inn” (Malon – lodging place, inn) which I have reproduced on the inn sign, on the side of the building.